Dry & Store is an electrical appliance for nightly use at home to store and care for all types of hearing instruments, including hearing aids, cochlear implant hardware, noise/tinnitus maskers, and in-ear monitors. It combines the three essential elements needed for effective drying: heat, moving air, and a desiccant that drives the relative humidity really low, and captures the moisture that is released. 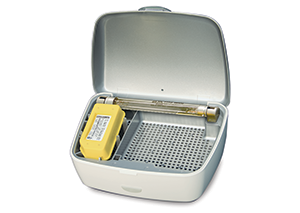 During the first ninety seconds of the Dry & Store Global II cycle, a germicidal lamp sanitizes the hearing instruments, after which conditioning continues for 8 hours. The unit then automatically shuts off, continuing to store the instruments safely until they are needed.